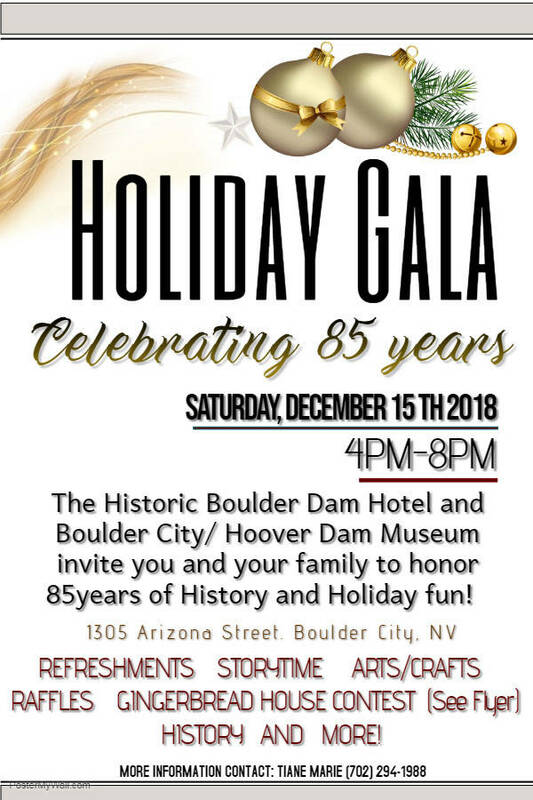 The Boulder City/Hoover Dam Museum is celebrating its 85th anniversary next week with a free holiday gala and gingerbread house contest. “We’ve been here for 85 years because of the community and I want to celebrate everyone,” said Development Officer/Collections Technician Tiane Marie, who organized the event. The holiday gala will be held from 4-8 p.m. Saturday, Dec. 15, at the Boulder Dam Hotel, 1305 Arizona St. Marie said the evening will feature a variety of activities. There will be Christmas movies playing in the museum, which is at the hotel, and the Boulder City Library will be there with story time and crafts. Ruben’s Wood Craft and Toys will have painting and crafts. Marie recently started working at the museum and learned that it didn’t hold a Christmas event. She wanted to change that. “I wanted to get a kick start on it so that moving forward we can have an annual one each year,” she said. The winners of the museum’s gingerbread house contest also will be chosen during the gala. “It’s all happening the same night,” said Marie. Marie said she got the idea for the contest because her child enjoys making them and she thought it could be a fun activity for families in town. Anyone who wants to participate in the contest needs to bring a gingerbread creation to the museum between Dec. 10 and Dec. 14. The houses will be judged during the gala and prizes will be given to the first, second and third places. Additionally at the gala, there will be pictures displayed of the hotel throughout its history. Santa Claus will be there from 5-6 p.m., and the Grinch will be there from 6-7 p.m. There also will be a place to drop off letters to Santa. Refreshments will be served from 5-7 p.m.
All the activities and food are free. Where: Boulder Dam Hotel, 1305 Arizona St.